Editor’s note: This is for all those who are wondering why their relative or friend who served in the Iraq war, or any other war, committed suicide on the battlefield or after coming home (and scores did) or why they are so changed on their return, mentally and emotionally. They will never hear it from the concerned relative or friend because he or she is dead or because none of them want to talk about the experience they had on the battlefield. It is hoped they will get some understanding on this issue after reading this. And, it is hoped our leaders who so blithely send our young ones, our future hopes, to wars, most of which are unnecessary and waged for political reasons, will think twice before waging another war. What follows is a reproduction of a 2016 article by Robert Fisk, as published in The Independent, published in England. He is a respected and well known writer. I was in the police station in the town of Fallujah when I realised the extent of the schizophrenia. Captain Christopher Cirino of the 82nd Airborne was trying to explain to me the nature of the attacks so regularly carried out against American forces in the Sunni Muslim Iraqi town. His men were billeted in a former presidential rest home down the road - "Dreamland", the Americans call it - but this was not the extent of his soldiers' disorientation. "The men we are being attacked by," he said, "are Syrian-trained terrorists and local freedom fighters." Come again? "Freedom fighters." But that's what Captain Cirino called them - and rightly so. Here's the reason. All American soldiers are supposed to believe - indeed have to believe, along with their President and his Defence Secretary, Donald Rumsfeld - that Osama bin Laden's "al-Qa'ida" guerrillas, pouring over Iraq's borders from Syria, Iran, Saudi Arabia (note how those close allies and neighbours of Iraq, Kuwait and Turkey are always left out of the equation), are assaulting United States forces as part of the "war on terror". Special forces soldiers are now being told by their officers that the "war on terror" has been transferred from America to Iraq, as if in some miraculous way, 11 September 2001 is now Iraq 2003. Note too how the Americans always leave the Iraqis out of the culpability bracket - unless they can be described as "Baath party remnants", "diehards" or "deadenders" by the US proconsul, Paul Bremer. Captain Cirino's problem, of course, is that he knows part of the truth. Ordinary Iraqis - many of them long-term enemies of Saddam Hussein - are attacking the American occupation army 35 times a day in the Baghdad area alone. And Captain Cirino works in Fallujah's local police station, where America's newly hired Iraqi policemen are the brothers and uncles and - no doubt - fathers of some of those now waging guerrilla war against American soldiers in Fallujah. Some of them, I suspect, are indeed themselves the "terrorists". So if he calls the bad guys "terrorists", the local cops - his first line of defence - would be very angry indeed. Little wonder, then, that Stars and Stripes, the American military's own newspaper, reported this month that one third of the soldiers in Iraq suffered from low morale. And is it any wonder, that being the case, that US forces in Iraq are shooting down the innocent, kicking and brutalising prisoners, trashing homes and - eyewitness testimony is coming from hundreds of Iraqis - stealing money from houses they are raiding? No, this is not Vietnam - where the Americans sometimes lost 3,000 men in a month - nor is the US army in Iraq turning into a rabble. Not yet. And they remain light years away from the butchery of Saddam's henchmen. But human-rights monitors, civilian occupation officials and journalists - not to mention Iraqis themselves - are increasingly appalled at the behaviour of the American military occupiers. Which is why Human Rights Watch and Amnesty and other humanitarian organisations are protesting ever more vigorously about the failure of the US army even to count the numbers of Iraqi dead, let alone account for their own role in killing civilians. "It is a tragedy that US soldiers have killed so many civilians in Baghdad," Human Rights Watch's Joe Stork said. "But it is really incredible that the US military does not even count these deaths." Human Rights Watch has counted 94 Iraqi civilians killed by Americans in the capital. The organisation also criticised American forces for humiliating prisoners, not least by their habit of placing their feet on the heads of prisoners. Some American soldiers are now being trained in Jordan - by Jordanians - in the "respect" that should be accorded to Iraqi civilians and about the culture of Islam. About time. But on the ground in Iraq, Americans have a licence to kill. Not a single soldier has been disciplined for shooting civilians - even when the fatality involves an Iraqi working for the occupation authorities. No action has been taken, for instance, over the soldier who fired a single shot through the window of an Italian diplomat's car, killing his translator, in northern Iraq. Nor against the soldiers of the 82nd Airborne who gunned down 14 Sunni Muslim protesters in Fallujah in April. (Captain Cirino was not involved.) Nor against the troops who shot dead 11 more protesters in Mosul. Sometimes, the evidence of low morale mounts over a long period. In one Iraqi city, for example, the "Coalition Provisional Authority" - which is what the occupation authorities call themselves - have instructed local money changers not to give dollars for Iraqi dinars to occupation soldiers: too many Iraqi dinars had been stolen by troops during house raids. Repeatedly, in Baghdad, Hillah, Tikrit, Mosul and Fallujah Iraqis have told me that they were robbed by American troops during raids and at checkpoints. Unless there is a monumental conspiracy on a nationwide scale by Iraqis, some of these reports must bear the stamp of truth. Suicides among US troops in Iraq have risen in recent months - up to three times the usual rate among American servicemen. At least 23 soldiers are believed to have taken their lives since the Anglo-American invasion and others have been wounded in attempting suicide. As usual, the US army only revealed this statistic following constant questioning. The daily attacks on Americans outside Baghdad - up to 50 in a night - go, like the civilian Iraqi dead, unrecorded. Travelling back from Fallujah to Baghdad after dark last month, I saw mortar explosions and tracer fire around 13 American bases - not a word of which was later revealed by the occupation authorities. At Baghdad airport last month, five mortar shells fell near the runway as a Jordanian airliner was boarding passengers for Amman. I saw this attack with my own eyes. That same afternoon, General Ricardo Sanchez, the senior US officer in Iraq, claimed he knew nothing about the attack, which - unless his junior officers are slovenly - he must have been well aware of. But can we expect anything else of an army that can wilfully mislead soldiers into writing "letters" to their home town papers in the US about improvements in Iraqi daily life. What influence, one might ask, have the Christian fundamentalists had on the American army in Iraq? For even if we ignore the Rev Franklin Graham, who has described Islam as "a very evil and wicked religion" before he went to lecture Pentagon officials - what is one to make of the officer responsible for tracking down Osama bin Laden, Lieutenant-General William "Jerry" Boykin, who told an audience in Oregon that Islamists hate the US "because we're a Christian nation, because our foundation and our roots are Judeo-Christian and the enemy is a guy called Satan". Recently promoted to deputy under-secretary of defence for intelligence, Boykin went on to say of the war against Mohammed Farrah Aidid in Somalia - in which he participated - that "I knew my God was bigger than his - I knew that my God was a real God and his was an idol". Secretary of Defence Donald Rumsfeld said of these extraordinary remarks that "it doesn't look like any rules were broken". We are now told that an "inquiry" into Boykin's comments is underway - an "inquiry" about as thorough, no doubt, as those held into the killing of civilians in Baghdad. Hundreds of thousands of federal employees are taking the brunt of the partial shutdown, going without paycheck in this holiday season, 380 thousand federal workers have been furloughed with no guarantee that they will be payed retroactively after the shutdown, 420 thousand employees deemed essential are working without pay, including 41 thousand law enforcement and correctional officers, not to mention tens of thousands of customs and border protection agents and customs officers.And, this is likely to continue for quite some time. Not affected by the shutdown are, among other, Trump’s senior adviser/daughter Ivanka Trump and her White House fellow employee husband Jared Kushner, both government employees in the Trump administration. 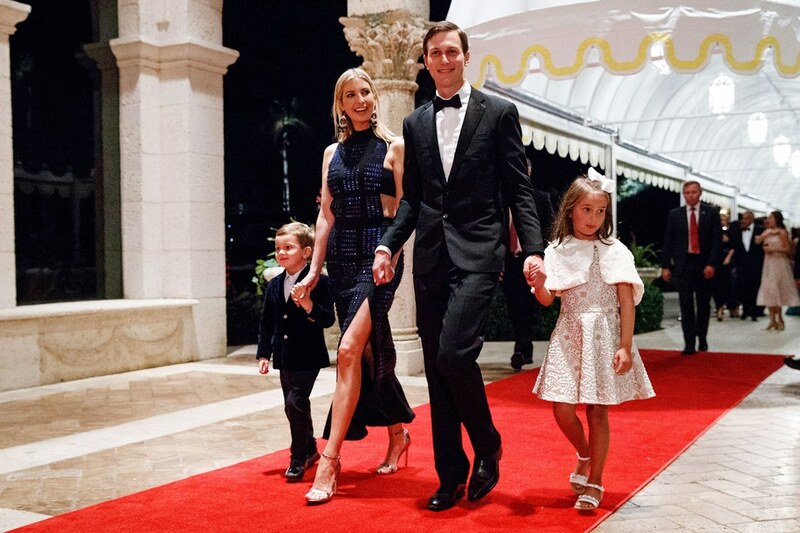 With a shocking disregard for the feelings of those impacted by the actions of her father, Ivanka and Jared chose to flaunt their wealth and power by taking a vacation, along with their three daughters, in Trump’s Florida estate at Mar-a-Lago. It may be mentioned that they were being looked after by their secret service detail which is NOT being paid! Facts: courtesy Don Lemon, MSNBC. "Making America Great". By giving a free pass to murderous ruler? Questioned by reporters as to why he was not taking a firm stand against the Saudis for the grizzly and gruesome murder of Khashoggi, an American resident and journalist who wrote in Washington Post, Trump replied, “It’s America first to me. It’s all about America first”. That is what he wants us to believe. However, the real reason was apparent in the words that followed. We all want America to be great. The question is whether president Trump’s handling of the Saudi murder of Hashoggi Is making America great or is it bringing shame on the nation. It is essential to remember relevant details. Khashoggi, an American resident, entered the Saudi consulate in Turkey to get some paperwork attended to. He never exited therefrom. On enquiries being made, the Saudis denied all knowledge. Later they said Khashoggi left the consulate and they had no knowledge as to where he went. Later a video was put out showing the back view of a man of the same height and weight as Hashoggi and wearing what appeared to be Hashoggi’s clothes emerging from the Saudi consulate and walking away. Yet later it was admitted that Hashoggi was killed in a scuffle that broke out in the consulate. Finally it was admitted that he was murdered and that the murder was premeditated. But, it was claimed, it was a rogue operation about which the Crown Prince of Saudi Arabia, Mohammed bin Salman (MBS) had no knowledge. A hasty “investigation” was held and five high ranking officials were sentenced to death. During this entire period Trump said there was no evidence that the Crown Prince was responsible. Ultimately the highest investigative body in USA, the CIA, announced its conclusion that “it had high confidence” that the murder was ordered by the Crown Prince himself. President Trump bent backwards and belittled CIA’s finding by saying “Maybe he (MBS) did, maybe he didn’t”. Agreed that thus is a complex situation. Agreed that holding the Crown Prince accountable or condemning him or imposing sanctions on Saudi Arabia may result in the alleged “hundreds of millions of dollars” worth of orders being cancelled or even Saudi Arabia breaking away from us. Is that enough reason to prevent our government from doing the right thing? From upholding the long held reputation of America putting honor above price? Also consider this. Thelorders would be for military hardware. True that this would bring in a lot of money and would provide a large number of jobs. It also would result in us exporting weapons of war -- planes, drones, tanks, missiles, bombs et al. It would facilitate raining of death and destruction, large areas being devastated, whole cities being flattened. It is often pointed out that America needs wars to keep its economy going. Must we continue down this road? Just as Saudi Arabia is trying to wean its economy from oil to other ventures we also must try to wean our economy away from manufacturing weapons of war to other venues. It is time to pay heed to the words of Dwight Eisenhower: “Every gun that is fired, every warship launched, every rocket fired signifies a theft from those who hunger and are not fed, those who are cold and are not clothed"
Anti=Semitism, Zionists, Jews, Israel -- and I ! Note:There is a lot of confusion about this subject and questions have been raised about where I stand. I hope this clarifies not only my position but also helps clarify the larger issues. Yes I am anti-Zionists, whether Jews or Christians, for one reason and one reason alone. Before I proceed further, please understand that not all Jews are Zionists and not all Zionists are Jews. A sizable section of Zionists are Christian Evangelicals, perhaps more influential in the US than Jewish Zionists. I am anti-Zionists not anti-Semitic. There is a big difference. Because their sole reason for existence, their sole aim and goal is to reclaim the Biblical Israel of old and replace not only the British Mandatory Palestine but all of Palestine with "Eretz Yisraeel", including Judea and Samaria. This inherently involves taking, by force, Palestinian land from Palestinians who have lived there for centuries and replacing the Arab Palestinians (Muslims and Christians) with Jews brought in from foreign countries. There is no justification for this and it is clearly against International Law. Furthermore, this goal is in the process of being achieved through unimaginable cruelty and violation of Human Rights, property rights and International law. All peace and justice loving people, all those who believe in and respect International law cannot be other than anti-Zionists. Am I against Jews having a homeland, a nation of their own? Certainly not. Indeed I have for long felt that the Jews should have a homeland of their own where they can feel safe, in control of their own destiny and practice freely, openly and publicly their faith and rites and customs. After all, the Hindus have Hindustan (India, nominally secular but with a commanding Hindu majority increasingly clamoring for renaming India as Hindutwada), Buddhists have Burma (Myanmar) and Muslims have several well-known homelands. But it would have been preferable for the Jews to have stuck to their original plea of “A land without a people for a people without a land”. Am I against the Jews having a homeland in Palestine? I think it would be preferable for the Jews themselves to have a homeland in a region more friendly and accepting towards them and that has more in common with them than the Mideast. As for having it in Palestine, no one would have any objection provided it was done with the consent and goodwill of the Palestinians. Though the Palestinians initially objected to the Jews establishing a homeland in any part of Palestine (a perfectly legitimate objection under International law), currently the Palestinians, those in control of the West Bank (PA) as also those in control of Gaza (Hamas), have agreed to the Jews having their homeland in 88% of the land the Palestinians had (far more than the 55% envisaged in the UN Partition Plan). Instead of accepting this most generous offer Israel is refusing to end its illegal, brutal and continuing occupation of the West Bank and Gaza, is demanding more land from the 22% of the land the Palestinians have agreed to accept and are putting more conditions for the Palestinians to accept before they end their illegal occupation and recognize a sovereign, independent state of Palestine in the meager 22% of the land the Palestinians had. It is this that those wanting peace with justice and those who believe in the rule of law and International law object to and are critical of. I honestly believe just as Muslims all over the world condemn and oppose ISIS and its cruel and barbaric acts, the time has come for the Jews to condemn, oppose and publicly denounce Israel’s continuing illegal occupation of the West bank and Gaza and its cruelty and injustice towards the Palestinians. The righteous Jews owe this to themselves. Israel, as it exists today, is disgracing the Judaic faith and Jews in general and is a clear and serious danger to the Jews all over the world. I was ten years old when I saw in the Illustrated Weekly of India (a Times of India publication which my family got every week) a photograph of a store with its glass font window smashed. In the caption below the photo I came across the word Kristallnacht. I was horrified at seeing the window smashed like that and mystified at Kristallnacht. It didn’t sound English. I did not know what it meant. In the days that followed I kept asking about it and was told that the Germans were angry at the Jews and were expressing their anger by destroying Jewish property and doin g violence against the Jews. Even at that young age I was very angry at what the Germans were doing and felt great compassion for the Jews. This compassion for the Jews grew as I learnt more about the subject and has remained with me ever since. It multiplied a hundredfold when I learnt about the Holocaust. Later in life I made friends with many Jews and found most of them to be friendly, kind and helpful. I will never forget that after my wife-to-be and I got secretly married against the wishes of both families, not sure where to go, we ended up having our first meal as husband and wife with Jewish friends at their house! Following the attack, groups are now using it to push their own agenda. Fingers are being pointed. Some blame Trump for inflaming an atmosphere of hate and anger. Others decry lack of needed gun control laws. Yet others tout stationing of armed guards at schools and places of worship. Being ignored is the fact that we have this inexplicable phenomenon of RISING anger and hatred towards Jews and, with it, acts of violence against them and against their property. Growing anti-Semitism is not only confined to America but is worldwide. The reasons for the rise being touted may apply but they cannot and do not apply to other parts of the world where tis violence is also on the rise. The fight against anti-Semitism will be better served by trying to find the root cause why it has flared up so horribly in recent times and then trying to deal with it effectively. Responsible for it are certainly not the Jews. Then who or what is responsible? All of us must dedicate ourselves to finding this out. Who violated international law on the high seas? 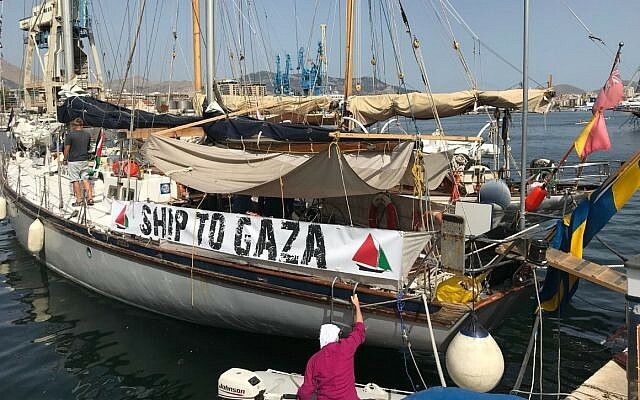 On Sunday, July 29 Israel seized a ship named Al Awda (The Return) bringing humanitarian aid to Gaza. On the final leg of the trip there were about 22 people representing 16 or 17 nationalities, Swedish, Norwegians, Americans, even Israelis, of diverse backgrounds. Most of those on board were Europeans. The cargo consisted of medical supplies to be donated to Gazans to meet the increasingly dire medical situation in Gaza. This is not the first time an attempt has been made by international activist to deliver badly needed supplies to Gaza which is under Israeli blockade. Gaza's 2 million inhabitants have been living under this blockade since 2007. 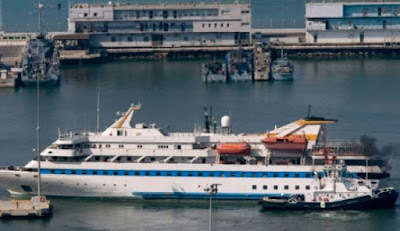 According to Israeli sources, this time the takeover of the ship was without incident. Israel navy said that it informed the passengers they were “violating the legal naval blockade” and that if they had humanitarian aid to deliver they could deliver it to Gaza through the port in nearby Ashdod. They were warned that if they did not turn around and persisted in attempting to go to Gaza, the ship would be seized and towed to Ashdod. And, according to Israel, this is what the Israeli navy did. 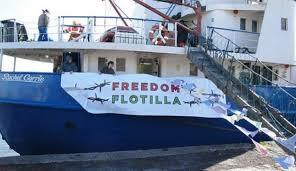 The Freedom Flotilla Coalition, a charity umbrella group which organizes these attempts, reported it slightly differently. It wrote that the Israeli navy claimed that the ship was breaking international law and threatened that it would use 'any measures necessary' to stop the ship. Was Al Awda ‘violating the legal naval blockade’? It is important to remember that the Al Awda bore a Norwegian flag. It was around 60 miles out of Gaza city when it was warned by the Israeli navy, boarded and ultimately seized. It was in International waters. It was not illegally crossing any internationally recognized border. The only “border” it was crossing was the border Israel had unilaterally set up in international waters, without any right or authority to do so. According to the 1982 convention, each country’s sovereign territorial waters extend to a maximum of 12 nautical miles (22 km) beyond its coast. Even in this zone foreign vessels are granted the right of ‘innocent passage’. There can be nothing more innocent than carrying medical supplies to those who need them badly. It can be argued that even if Al Awda was within 12 nautical miles of Gaza, it would still not be breaking any international law, having a right under the ‘innocent passage’ clause to be there. Besides, Israel says again and again that it has pulled out of Gaza and given it to the Gazans. Gaza, according to Israel, is no longer Israeli territory. If that be so, the sea abutting Gaza would be the territorial waters of Gaza not Israel. This is not all. Just a few days after seizing Al Awda Israel turned its attention on another Flotilla boat, a 100% wind powered sailing vessel named Freedom, sailing under a Swedish flag. It was to be a gift for the Palestinian fishers and was carrying a cargo of medical supplies. It was surrounded in international waters about 40 nautical miles from the coast of Gaza, was boarded and seized by Israeli naval commandos. The organizers of the vessel Freedom have asserted the right of ‘innocent passage’ guaranteed under the UN Convention on the Law of the Sea 1982 and called upon international authorities to protect the small yacht. I leave untouched, for now, the claim of Israel that the seizure of Al Awda was without incident but I cannot refrain from commenting that Israel has learnt well from those that gifted Palestine to them for their ‘homeland’. The British are past master at ‘drawing a line in the sand’ and carving up nations, replacing large entities with smaller ones, easier to control and dominate. That is what Israel is doing in international waters, drawing lines that other vessels belonging to other nations cannot cross. And that is what it has done in Gaza. Within Gaza, which it claims is no longer Israeli territory, it has set up a three mile deep ‘security zone’ running the entire length of the border between Gaza and Israel, a zone which no Gazan can enter without risking being shot dead by Israeli forces while still in Gaza! Lines have been drawn by Israel even in the West Bank carving it into small ghettos which cannot be entered or left by Palestinians without permission from checkpoints set up by Israel! As for Israeli Navy’s threat that it would use 'any measures necessary' to stop ships in international waters, the only 'necessary measures' would be to end the blockade of Gaza. Today the amazing man who I have the privilege of calling my father will be laid to rest in England. My dad was a quiet achiever. He left India for England in 1965, two years later joined the National Gallery in London as a Warder and within 6 years was promoted to Chief Warder – which was an incredible achievement for an Indian migrant in the 1970s. In 1975 he and my mother Thelma were presented to the Queen of England on the opening of a new gallery wing. 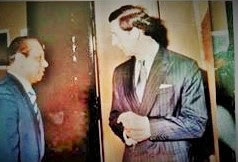 In 1977 he was presented with the Queen’s Silver Jubilee medal and again in 1988 was awarded the B.E.M. on the Queens New Years Honours list, both amazing achievements for mail driver from India. We re incredibly proud of his achievements and of the man that he was. He leaves behind so many wonderful memories and I will miss him terribly. Rest in peace my wonderful dad.